It's been quite some time since I have posted on here. 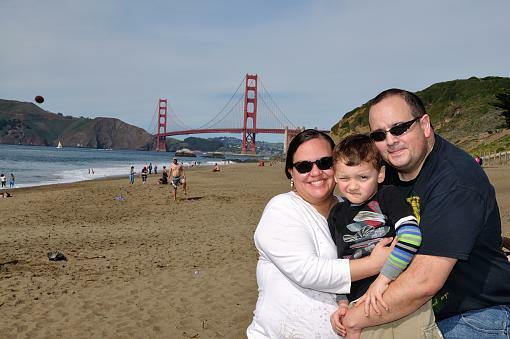 My fiancé, son and I went to San Francisco for the weekend. I know I have probably done some things wrong and I am looking to get some feedback. Dave, I can't see anything wrong. It's a decent shot, as you got you and your family nice and sharp, with the bridge in pretty good view behind you. My only criticism if you could call it that would be that it's not a creative shot, but it wasn't really meant to be, either. So nice job. I appreciate you taking the time to give me your input. I was thinking my mistake was not using a diffuser on my SB900. I just turned the power down quite a bit. I've always wanted to take a class on light or any class for that matter. I've started listening to improvephotography.com's podcast while working nights and it's really got me wanting to get out there to start shooting again. Thanks again. This looks like a nice family shot and exposure and sharpness look good to me. If you wanted to do anything to improve it is to clone out the ball just above the hills as its a little distracting. I just turned the power down quite a bit. I've always wanted to take a class on light or any class for that matter. I've started listening to improvephotography.com's podcast while working nights and it's really got me wanting to get out there to start shooting again. Can anyone suggest if I can find useful information about camera stabilizer or gimbal in this forum? I searched some keywords, and found few results.